An extra inning foul ball found home plate umpire Tom Hallion's mask in Philadelphia, prompting his early exit from a lengthy game already threatened by rain. 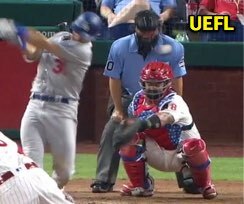 In the top of the 10th inning of Tuesday's Dodgers-Phillies game, Dodgers batter Joc Pederson fouled a first-pitch 93.8-mph cutter from Phillies pitcher Tommy Hunter into the lower portion of Hallion's traditional-style facemask. Hallion left the game at the conclusion of the half-inning, with 2B Umpire Phil Cuzzi taking over behind the plate as acting crew chief, while 1B Umpire Adam Hamari and 3B Umpire Ryan Blakney manned the foul lines. Relevant Injury History: Hallion suffered a foul ball injury to the head in Baltimore on August 19, 2017, missing eight days in its aftermath, having left his July 1, 2015 assignment due to another foul ball to the facemask.